Once babies start moving, they don’t stop! We have designed our little crawlers class for children 12-18 months to encourage adventure in a safe and secure environment. We keep the surroundings safe so that as mobile infants begin to explore and walk they can do so with confidence. 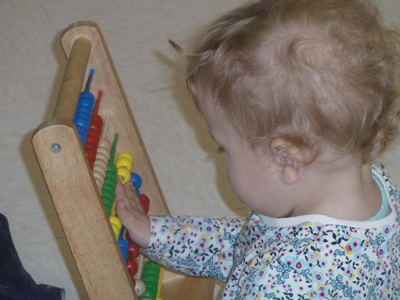 During this time we continue to stimulate child’s brain and thought development. At this stage in their life, children begin forming words and eventually short sentences. We work with them through storytelling and music to establish a solid foundation in language and social skills. Teachers at Learning Ladders aid in the development of these skills by storytelling and encouraging students to participate in classroom activities. At this age children are becoming increasingly aware of their surroundings and want to explore them. As your child plays and interacts with the people and objects around him, he learns about his body, his home, and the world around him. Understanding language is far more important to your toddler than actually speaking it. Once they really understand, they will communicate with you. At Learning Ladders teaching and play go hand in hand. Everything to the child is fun and a discovery. Learning to recognize letters of the alphabet in a colorful book is just as much fun as playing in a sandbox. Learning Ladders provides toys such as balls, building blocks, musical toys, and dolls to support the mental development of children.